And now, the daily lesson planning part. First I find a current and relevant AuthRes. 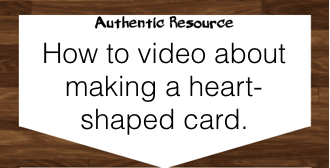 For a mini-unit on “Love,” I found a video of a young lady explaining how to make a heart-shaped note (origami). I love “how to” videos because they get to hear someone other than me talking in the TL and they are very visual. Next I write two goals based on it: Input and Output. Before they even see the video, I like to connect to prior learning to help them understand what they will hear/see/read. For this video, I will see what TL words/phrases they think they will hear during the video. I have several options for interpretive tasks. I like to show the video several times where they are listening/doing/looking for something different each time. To save time, this is where I pull generic activities and just do quick adjustments if needed. Schools have trained students to skim in order to answer comprehension questions as an interpretive task. They are not invested in their learning. I’m finding that if I’m pre-teaching and telling them what the important phrases/words are, then I’m squashing their curiosity and doing the higher level learning for them. I’m also assuming everyone is on the same proficiency level, which is rarely the reality. Furthermore, I want them to figure out what is important so they can also do that in real life contexts. This is the part that I am still working on improving in my own lessons. After an ACTFL training, I really started to think about how I can make this more authentic. Their example was: If you heard a traffic report on the radio, what would you do next? The answer is NOT to answer comprehension. It may be to call/text your friend who travels on that road and tell them to go another way. They may ask questions, but it is in a conversation. Based on this AuthRes, I thought that a natural task would be to explain to someone else how to make this origami. To make it feel more authentic, I could find another origami video, give half of the class one video and the other half the other one. Then they could partner up and their partner how to do the one they had. 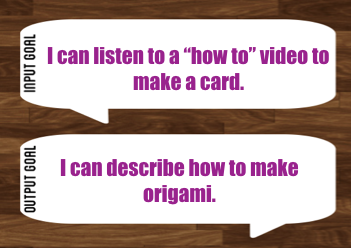 Maybe this could be a homework activity (find another origami video or teach someone at home or make your own video). 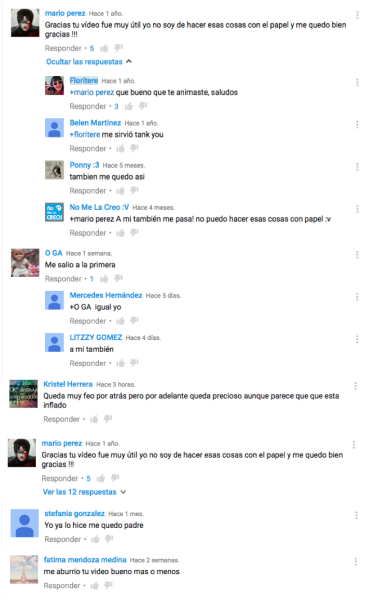 While looking at the video, I noticed that the comments could also be a great resource. Also it is something that people really do if they love/hate a video. I’m not encouraging trolling though! So here’s a glimpse of another goal that could lead into more lessons. I screenshot and combined the comments that were appropriate on one sheet so they can mark them as positive or negative. Bonus if they can find the errors. One last note, I plan all this out as one continuous lesson. Then I decide where to stop for each class period. I don’t have lessons where we always do listening on one day, speaking next, etc. I just let this flow happen naturally. If it takes 2 classes to do the interpretive activities, then fine! If we can get through all of them in one class, then fine! This keeps my lessons connected and building on prior ones every day. For this lesson, I decided to do a formative assessment about the interpretive goal only. And there it is. One way to let AuthRes take the Lead when lesson planning❣ Now I feel like I got a good ROI on this ONE resource. 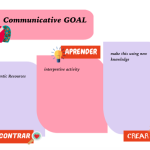 This download is “Festeja el Amor”, which includes 4 goals based on authentic resources and planned out very similar to this post. I am a huge fan of kicking comprehension questions out of the interpretive assessment and using it as part of the presentational assessment, the way the AP exam does, the way your origami does! That’s why there’s no interpretive “section” in my rubric. On the semester exam last semester I use the JCPS 1A assessment and added some activities of my own, including listening to a boy say what he wanted for Three Kings’ Day. But the boy can’t write, so you have to help him – and then you decide hey, what if this works? I’ll write my own. So I got a presentational task that allowed me to evaluate their listening comprehension; the student wrote ‘I want a TMNT backpack but I have a red car’ – which was backwards from what the boy actually said. Thanks for giving more examples of this! Welcome! Your example shows exactly how the authres leads to so many activities, including some good scenario-based IPA assessments. Ok, my head is spinning. I am so grateful for both of your blogs, by the way. I am a 2nd year mid and high school Spanish teacher and absorbing all of your great ideas takes me a little time, and I sometimes need to pursue some clarification. Sarah, when you refer to using comprehension questions as part of a presentational assessment…what do you mean? The language curriculum at my school uses a 4-part speaking-reading-writing-listening test at the end of each unit, so I’m trying to wrap my head around how I would utilize comprehension questions for a presentational speaking or writing test. I’m impressed Melissa! I was just keeping my head above water year 2, and year 3. Melissa, I phrased my comment poorly – I didn’t mean I actually use comprehension questions within the presentational assessment. I use comprehension questions very minimally. 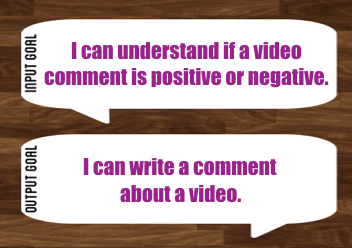 Rather, I ask students to use the resource and incorporate it in the presentational task. In my example, I asked students to listen to a little boy who didn’t know how to write yet as he explained what he wanted from the Three Kings. Their task was to write his letter for him. So, if they didn’t express his wishes correctly (as in the case with the girl who got it backwards, saying he had a red car but wanted a TMNT backpack), I knew they didn’t get the key parts of the listening source. Does that make sense? 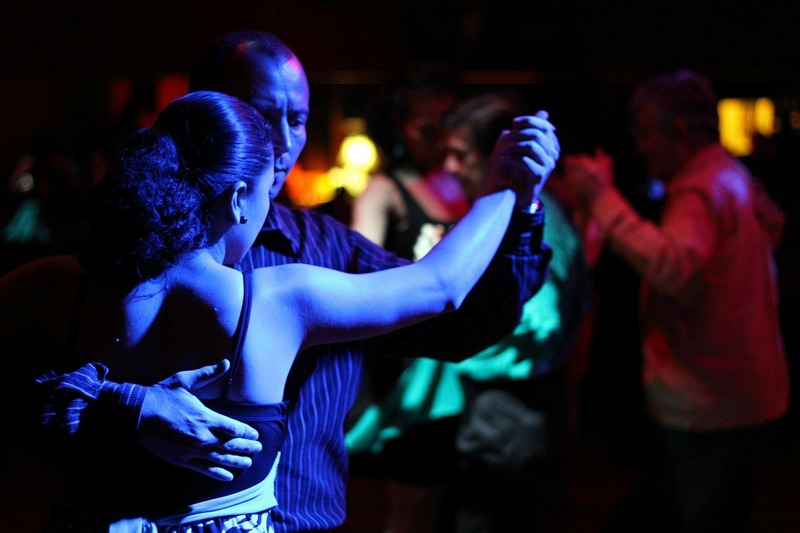 This is a critical part of the presentational part of the AP Spanish exam – students are required to incorporate what they learn from the interpretive sources into their presentational product. One of my goals is to figure out how that trickles down into Spanish 1! This makes more sense to me now, thank you! I’m going to figure out a way to do this. I am currently working on a unit plan (parent/teacher conference night!) for ¿Conoces a mi familia? that involves description of people and describing what their family is like… On to look for authentic sources! My initial thoughts are that they could see some sort of interview or YouTube video in which someone describes what their family is like within an interview or conversation or even just in the whole YouTuber format (where someone is just talking to the camera), and then the students could write or say how that person is similar to, or different from their own family. Hmm… more to think about. My students did not want to talk about their families immediately. It helped when I started with the AuthRes about another family and then they compared. 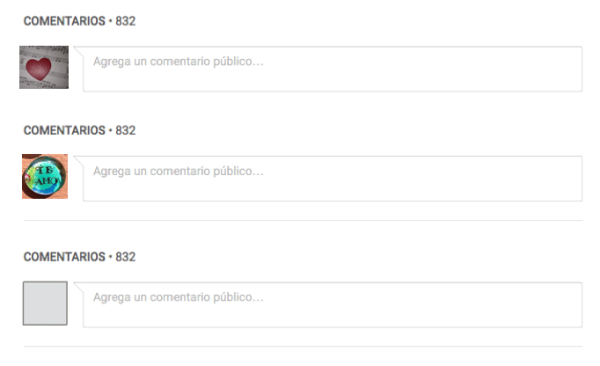 On the “Chispas” page, we have a lot of authres for family already there. Thank you for this very clear and extremely helpful explanation! It makes me want to teach a class! Thanks again! All of these posts have been so useful. I’m thinking a little about your ROI comment from an earlier post, and this is something that I struggle with a lot (work-life balance in general). Right now I teach 6 different preps. What are your thoughts on using the same AuthRes for different levels, but targeting different communication or proficiency goals? Absolutely!! This is how I survived 4 preps (hats off to you for 6!). I aligned my curriculum where all levels had a similar unit topic at the same time, but they were looking at it for slightly different examples and with different proficiency expectations. I was also on a cart when I made this decision so I didn’t have a ton of resources to move. This also gives me extra time to keep my resources fresh and relevant. Other bonus, it gives you a chance to have all levels to collaborate (a field trip, a speaker, a festival, a showcase, teaching each other, etc). Thank you for this! I will be returning from maternity leave soon and I want to streamline my lessons while still using authentic resources! It´s incredible how much you can learn when you have this extra time to read wonderful blogs like yours. This is very helpful for planning, thank you for sharing! I tried to click on the last image to get the blank download, but it gave me the page not found message. Is there another place to find the download? Hello Celeste! Glad to hear that. I’ve updated the link now. Sorry about that inconvenience.